Where have all the bus riders gone? Nearly every major transit agency in the nation saw ridership decline last year, and Miami was no exception. In fact, the drop has been especially steep, falling 25 percent since 2013. The popular narrative casts transit as inherently inferior to driving, or blames new arrivals on the transportation scene like Uber. But those theories rely on intuition and guesswork, not research. Transit Alliance chair Marta Viciedo said the research drives home the point that public officials and policy makers at Miami-Dade Transit can turn around flagging bus ridership. Here’s a look at what they found. In the past year, Miami-Dade Transit cut service on 39 bus routes, affecting one in two local bus riders. Service was increased on just a single route. The agency also has a habit of tinkering with its most popular routes, “throwing their ridership off a cliff, and priming them to be eliminated,” the Transit Alliance says. That was the case with Route 103 C, which saw ridership drop after service to Government Center loop was cut. With less service, buses come less often, and the waits grow longer for bus riders. About 75 percent of the Miami-Dade Transit bus routes don’t come more frequently than every half hour. That’s a long time to wait in Mimi’s sweltering heat, especially since only one in four bus stops provides any shelter. “Riders are facing longer wait times, unreliable service, and a poorly designed route network facing haphazard cuts – sending the system into a death spiral of plunging ridership,”writes the Transit Alliance. The Transit Alliance has been tracking how well buses adhere to their schedules, uncovering serious problems with reliability. About 500 bus runs start late each month, and hundreds more more never make the scheduled run at all. Over a three-month period, the group counted 2,103 “ghost buses” that never arrived, a 152 percent increase over the same period the previous year. Imagine waiting in the hot Miami sun for a bus that never shows. No wonder people are opting out. 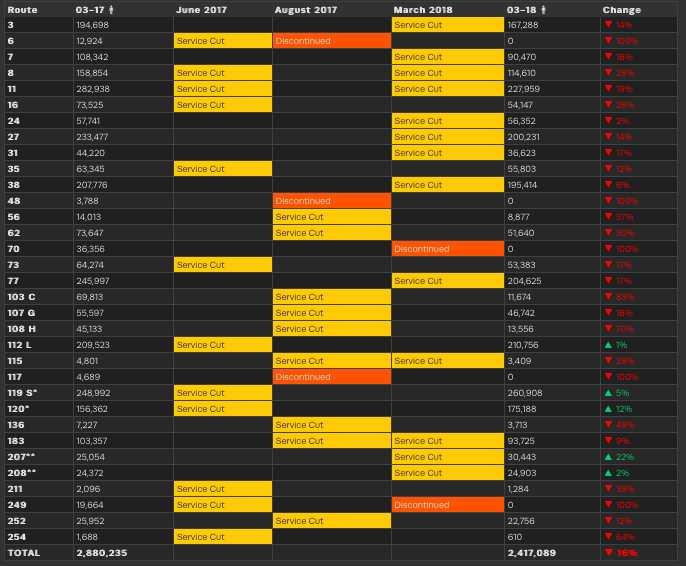 Each X in this chart represents a scheduled bus that never arrived in the first three months of 2018. How are people getting around if they’re not riding the bus? It looks like many of them are switching to driving. 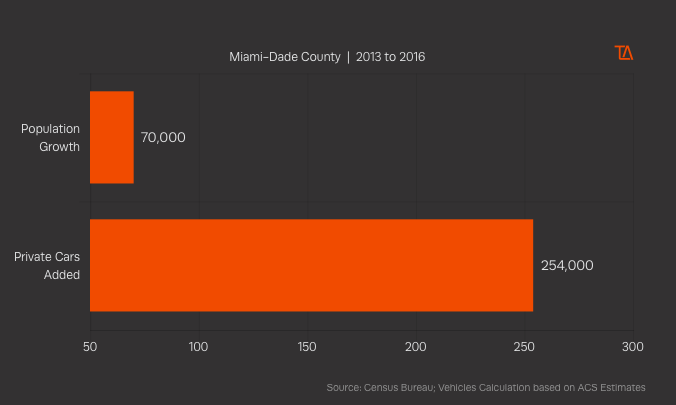 In Miami-Dade County, the number of registered vehicles has increased 3.5 times faster than population growth since 2013. National experts point to an improving economy and lax lending standards for car buyers as contributing factors behind this trend. Unfortunately, the lending terms for low-income buyers are often predatory, and people with bad credit and low incomes who take out car loans may be trading crummy transit for punishing monthly payments. All well and good but this fails to account for the more important issues. Don’t forget Miami transit is also one of the most expensive monthly passes in the nation. They’re just cutting service to set up for the next election where they want yet another sales tax increase. No, for real, they double super promise they’ll fix it this time.